Gail Herman: Tell me the name of your mine. John Ayers: Well I had Bakertown Coal Company, then when I went to surface mining, I went to Ayers Coal Company then. But it was Bakertown. We wasn't really domestic, like we would work, we just sold fire-coal, house coal. We would have maybe 8 or 10 of these cars, and there was 2 or 3 guys working. If a truck didn't come in all we sold was just to somebody buying it for their house. Well, I guess about the end of April you would shut down till September, till people started needing coal. You didn't do nothing all summer, you just closed it down. Then if there come a day you didn't sell no coal, you didn't have no cars to load, then you just didn't get no work. I mean it just in the winter time, well years ago there was a lot of people burning fire-coal, I call it, or house coal, and that's all I did up for I guess for 20 to 25 years I worked. G.H. : Now when did you start yours? J.A. : I started in '57 I guess. That's when I started doing mine. G.H. : And you ended in? J.A. : Well I just ended here -well like I said I really haven't ended yet! Not altogether, I don't have all my money back, but I ended about three years ago. Well I'm 64 and I was 62 when I got my, took my Social Security then at that time. G.H. : Was that a deep mine or a strip mine? J.A. : Deep mine. It was all deep mine. J.A. : Bakertown Coal Company it was, back then. But then this here, all this would be coming up out of the mine with the pony. 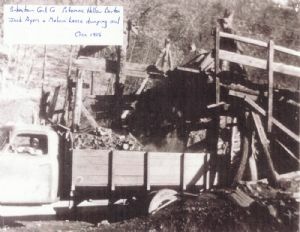 But here is how we dumped it on the trucks, see they was coming in buying the coal and you dumped it on the truck. G.H. : So you didn't have to deliver, they came and got it. J.A. : We didn't deliver, no. We just got different guys coming, no we didn't deliver we just got the coal out, the truck come there. G.H. : Now what was the name of this little horse? J.A. : That was Red. He was the best pony I ever had. That's got a name pony, pony named Red, she's got it on there. G.H. : And these people here? J.A. : This is me here. But I had a big vein up there on the hill too, up where they're stripping and these two was from Washington. My older sister’s brother- in-law and his wife was up here, and they is never seen a mine so I took them up there to show them. And that is the one I sent to my father down in Kentucky, but he was doing that for Consol, putting that opening in there. G. H.: 1909 the picture. Now when your father came here, did he work in a mine? J.A. : Yeah, he worked in the mine all his life too. He had a farm up there. He would work the farm in the summer time when there weren't no, like I just said, to sell the house coal, you couldn't sell it cause you were warm then. G.H. : Here in Allegany County? J.A. : Yeah, just right here on the hill. J.A. : Yeah, he worked the Bakertown Coal Company, that's where I started with him then. G.H. : So you were partners? J.A. : Yeah, well he only worked with me a few years and then he retired then, and then I had it all to myself. Like I say, I never got big, I never had no amount of men or nothing, it was just 4 or 5 of us. G.H. : Now is this portal closed now, or is it still in operation? J.A. : That was down in Kentucky that there so I… they was all closed, yeah. J.A. : Yeah, they're all closed too. There's no deep mines now, not little ones anyhow. You really can't, couldn't afford to operate. I couldn't put a deep mine in myself, it's just too many rules and regulations you got to be a couple millionaire. When I was a kid if you wanted to put a deep mine in you got a pick and shovel and went out and started - if you knew where it was- and you started digging a hole. You didn't have to ask nobody then, you just went out… well the mine inspector would come around and inspect you, but that's all there was to it. It's really changed since that. Well the last one I put in up the hallow here, I'd say that was in the early '60's, the creek was in the way and I just moved the creek over here, I mean if you try that today… you'd be in jail for a night. But I mean it is just the way things are changing; the little man he couldn't do it. Can't do it today like you used to do it. I mean it takes a lot of money to put a mine in today it would. G.H. : So how many little mines would you say Baker Coal had? J.A. : Well up this hallow there used to be about 4 of us. They don't go up there that far, a mile, 4 little different places in there, couple big veins up there so there was about 7 mines up this one hallow here. There was a lot of them back years ago. G.H. : And Baker Coal owned them all? J.A. : No that's the name of the coal, Bakertown. Bakertown coal was what we was in. J.A. : Yeah, that's a seam. Bakertown or Barton, yeah, is what it is, and that was the seam of coal, but mine was Bakertown coal. G.H. : So you had one of those seven mines? J.A. : Yeah, other people had others. Just local people, all local, all that is just local people. G.H. : How deep down did it go would you think, did you have a mine map in those days, or? J.A. : No, we never had to keep a map. Oh, I was back about 3/4 to a half-mile -something like that. A lot of them went further than that now, that wasn't . . . The bigger mines had a bunch of men, they went practically through the mountains. I mean they didn’t. G.H. : And how many people worked there with you? Did you have working for you? J.A. : Not over four. Like myself and maybe three other guys all the time. Something like that. But a lot of mines, they had 50-75 men, you know, on these big ones. This photograph of John Ayers with his pony Red was made available by Dan Whetzel. Mr Whetzel interviewed Mr. Ayers for the Coal Heritage Trail, a cultural survey sponsored by Maryland Historical Trust, 2001.